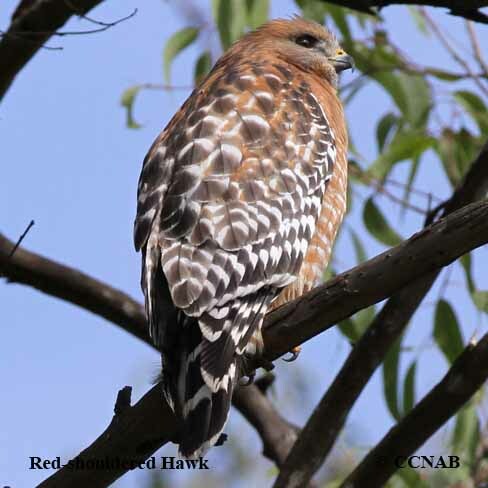 Species: The Red-shouldered Hawk (Buteo lineatus) is a medium size buteo, larger than the Broad-winged Hawk, but smaller than the Swainson's or Red-tailed Hawks. Most likely to prey upon insects, frogs, snakes and the odd small bird. 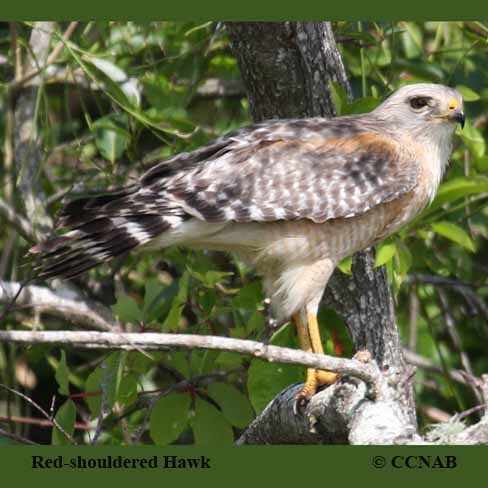 Prefers lowlands, with wet areas, bordering water or swamps, where it will perch on a limb, dropping down unto its unsuspecting prey. 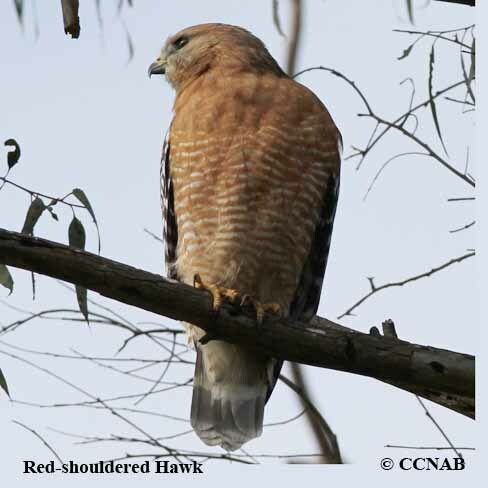 Distinctions: Adults are similar in appearance, the male being the larger of the two, this is different from most buteo species. 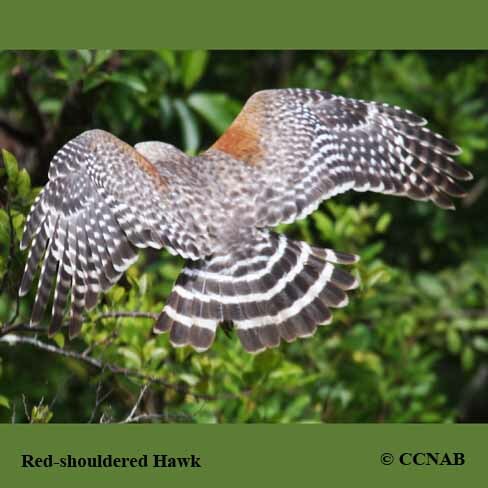 Mature birds have rufous and brown bodies, rufous shoulders, rufous ranges from light colouring to deeper colours, depending what areas of North America, it is seen in. There are at least four, maybe five sub-species. 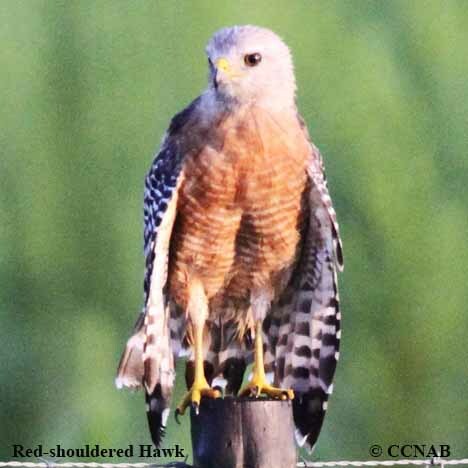 When seen flying, clear undistinguished spots, show on outer portions of the under-wings. Checkered patterns seen over the larger area of the wings. Multiple white tail bands. 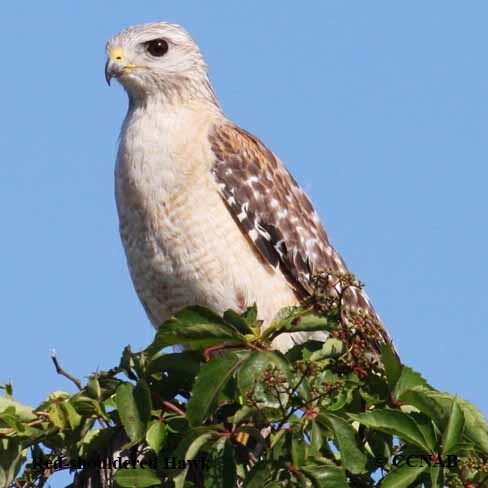 Assume a vertical stance, more so than other buteos, when seen perched. 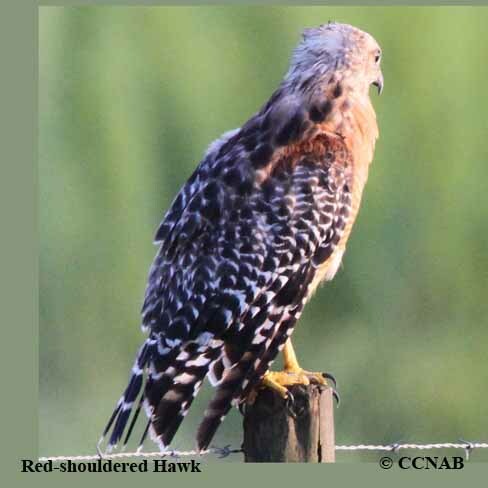 Juvenile different from adults, lighter coloured plumage, and not as pronounced in markings. Voice: Multiple call notes, one, two syllable call, follow by a number of repeated, but different two syllable call notes. 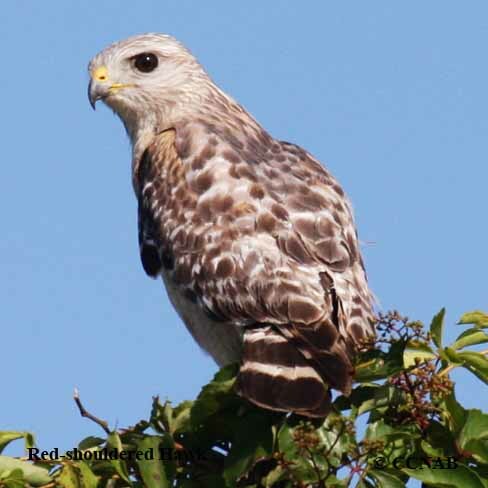 It is the most vocal buteo in its group. Nesting: Two to three bluish off white, brown spotted eggs, one brood per year. Nest built in mature trees, high above the ground, usually deciduous in nature, located in a low lying area, with standing water nearby. Built from branches, sticks, twigs, leaves and softer materials, such as grasses. 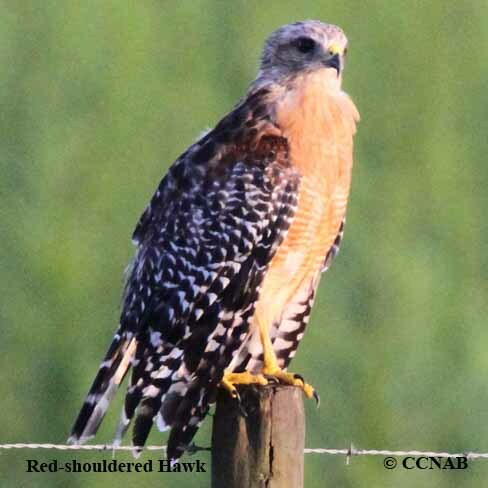 Distribution: Seen in New Brunswick, west through Western Ontario, into the mid-northern states, south into the eastern half of Texas, east to the tip of Florida. A separate population west of the Sierra Mountain chain in California. Overall numbers doing okay, population appears stable.